Is there a site I can go to to order the white iodine? I just had to join this site to let you all know, that Nolasandy is absolutely right about the white iodine! 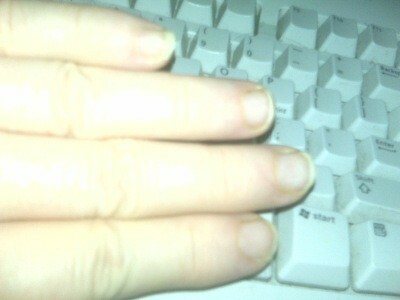 I have bitten my nails for over 40 years and my cuticles were a ragged, bloody mess too. I started using the white iodine once a day for about 2 weeks and I started seeing a difference in my nails just after the second day! 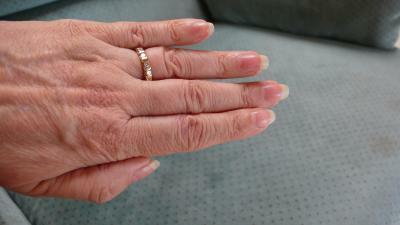 Nails are porous; is this medically safe? I am surely going to ask my doctor if this is medically safe. If it is, I definitely will try it, as my nails are terrible! Thank you for sharing, and God bless you! Is white iodine the same as colorless iodine?? Thanks for sharing. I went right out and bought some. Is it ok to put over nail polish? Do you think it will absorb it ? Thanks for the update. I will surely try this remedy! The question regarding whether the nail will absorb the iodine over nail polish is a good one. I rather doubt it. I always put some under my extended nails. However, I can't keep polish on too long anyway, so I always recoat my nails when I am redoing my polish. I hope everyone who tries this leaves a feedback on how it works for them. I'd love to know I helped somebody with this problem. I think this might be okay in short term, but dries out longer term. I used to use a hardener and worked great for a while - then back to peeling and cracks. FYi - I now use flexinail and am very happy. IS WHITE IODINE THE SAME AS DECOLORIZED IODINE? It is also called IODIDES TINCTURE. Got a 2 oz bottle at Walgreens from the pharmacist and he didn't realize he had any. Hi Christa, Yes, white iodine is the same as decolorized iodine ( or colorless or clear). Just thought you might like to know that regular iodine is very commonly applied to horses hooves to harden them...especially the soles as some horses are tenderfooted there. So it is reasonable to assume that white iodine would work on human nails which are pretty much made of the same stuff as horses' hooves! I'm going to try it for my splitting nails. It seems like every time I do something with my horse I break another nail! I started using the White (or decolorized iodine) as per suggestions on this forum I also use Flexinail but when that is gone I will try switching to castor oil. Well, the iodine works so well. I got 2 small bottles at Walgreens for $4.50. The pharmacist had to order it and it took only 1 day to get it. Thank you to everyone who wrote about this. I have spent a fortune over 50 years trying to find a solution to my problem nails. This one thing has made a huge difference in my life. Thank you to all. I'm guessing the girl who wrote about switching from the iodine to flexinail might not see this because it was so long ago. But I am wondering, if the iodine worked in the beginning and then the dryness splits and peels came while using it or was it because you stopped. And for the flexinail, if I stop will it do the same? Nolasandy is quite right with the white Iodine. I told a friend to use it on her weak fingernails and within a week she started seeing stronger nails and they only got stronger. Cheap and easy and really. And why didn't I think to post that information! Sheesh! Will try, frustrated 76 yr old nurse. My nails are usually thick/normal but the middle one splits down! It is now about 2 millimeters below the quick. How do I stop and repair this? Thank you for sharing...I will be trying it! Do you have to keep your fingernails clear of any polish while using the Iodine? Does the white iodine come in a liquid polish?